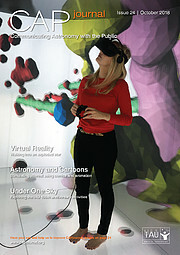 The 24th issue of the Communicating Astronomy with the Public journal is out now! In this issue you will find information about the launch of the International Astronomical Union's 100th anniversary celebrations. Also, you will find articles exploring the uses of technology in astronomy communication, including virtual observatories, virtual reality technologies, video and animations.